In a shocking discovery, the Times revealed today that no one is dining at an Applebee's in Manhattan: in fact, the restaurant is full of empty tables. The exact reason is unclear, but it may be because there are so many other similarly mediocre restaurants in the Times Square area offering up stiff competition, including Chevy's, Dallas BBQ, ESPN Zone, and Dave & Busters. 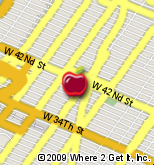 Will Manhattan's dining scene survive without Applebee's? Where will local heroes like Plaxico Burress eat before putting a loaded weapon into the elastic waistband of their pants? If such pinnacles of New York fine cuisine fall prey to the recession, the future looks grim indeed.